The innate desire to showcase one’s products and/or services for sale in an effort to be successful is one that dates back to the marketplaces of antiquity. For example, evidence suggests that Umbricius Scauras of Pompeii, circa 35 C.E., had mosaics on display in his household indicating the fish sauce he was known to manufacture—an inscription translated as “The flower of garum (fish sauce), made of the mackerel, a product of Scauras, from the shop of Scauras.” Commercialized marketing as we know it today is more common starting in the 19th century, when printed newspaper ads reigned supreme. As is evidenced in the fact that you are able to read this blog right now, marketing evolves as means of communication do. Cue the age of digital marketing. 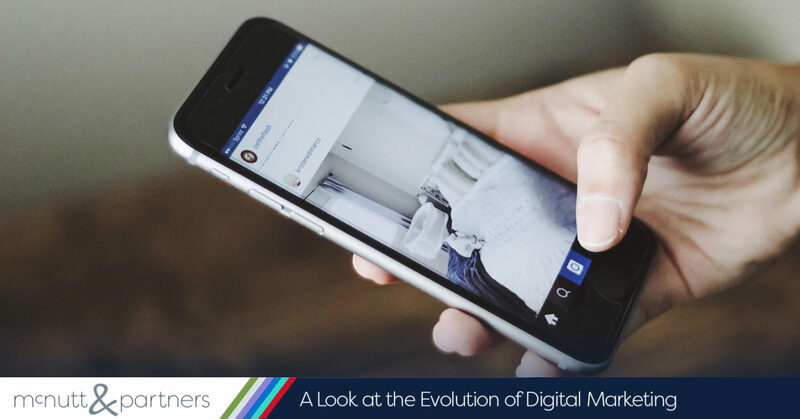 Here, we’ll take a look at the evolution of digital marketing while pinpointing the specific advancements in technology that got us to this point. Tech company IBM launched the first personal computer in 1981, and the rest is history. The roots of digital marketing were planted during this decade, at which time computers became sophisticated enough to store large volumes of consumer information. Databases were used to store and organize customer information, initiating the shift between simply selling a product and personalizing marketing efforts based on consumer preferences. In 1986, contact and customer management company ACT! introduced the first database marketing software to the business realm. 1990s: The mass adoption of the internet. This is arguably the single most significant event that has affected marketing over the past three decades. The World Wide Web project launched in 1991, but mass internet use did not take off until the introduction of the first successful large-scale web browser, Netscape, in 1994. Over the next two years, the number of people using the internet grew from 16 million to 70 million. In 1996, Americans were spending an average of 30 minutes per day online (significant for that time period). With more internet users came more opportunities for email, search engines and e-commerce sites to thrive. Yahoo! and Amazon launched in 1994, eBay in 1995 and Google in 1997. Email became a popular form of marketing, up there with traditional mediums like TV, radio and print. During this time, the customer information databases of the 1980s were evolving into what we know today as Customer Relationship Management (CRM) software. First called Sales Force Automation (SFA), this technology automated the functions of database marketing, including tracking interactions, controlling inventory and more. In 1999, the first Software-as-a-Service (SaaS) company was born—Salesforce.com. Salesforce changed the game by helping businesses not only collect and store customer data, but interpret it as it applies to consumer trends in a web-based fashion. 2000s: Social media is born. As more and more people were now using the internet to research products and services, a concept called marketing automation was conceived, which was the first technology built by marketers for marketers with a digital foundation. Marketing automation refers to software platforms designed for marketing companies to allow them to better market on multiple online channels at once. In 2001, the dot com bubble burst, and marketers began to rely more heavily on inbound marketing via information sharing—with the consumer now taking an active role in sharing their own information via social media. LinkedIn was founded in 2002, Facebook in 2004, YouTube in 2005 and Twitter in 2006. With social media as an aid, it became easier for marketers to start tracking trends in consumer behavior. Marketing became channel-specific as these social platforms became increasingly popular. 2010s: Smartphones overtake personal computers. In the evolution of digital marketing, we are still catching up with the proliferation of smartphones. Smartphones are now the primary digital device people use for getting online, with U.S. adults spending an average of 258 minutes per day on mobile media in 2017. Though the iPhone was released in 2007, it has taken the past decade for smart phone use to truly become an everyday staple for the masses. Now, digital marketing is about integrating oneself into the mobile experience. Apps, augmented reality and more continue to push the limits as to what is possible in the digital marketing realm. The challenge for marketers is to provide consumers a seamless experience across multiple digital venues, rather than considering the dissemination of their content from channel to channel. The evolution of digital marketing so far has involved the swift adaptation of the earliest personal computers taking up space on a physical desktop to the ability to harness the internet at our fingertips. For more insight into the digital marketing community, continue to follow the McNutt & Partners blog.